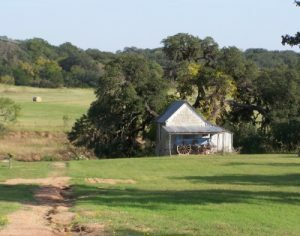 I think most people, when they have a mental vision of an Army fort on the far western American frontier, think of a wooden stockade of standing timber – but that was not much the case in Texas. Indians rarely to never attack those forts, so defensive walls were hardly necessary. With or without protection from the Army, the frontier advanced almost too rapidly and too erratically for many of the earlier established forts to remain useful for long. 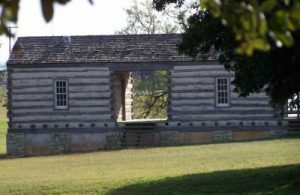 Fort Martin Scott, on the eastern outskirts of Fredericksburg, just off US Route 290 is one such. 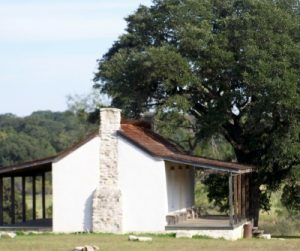 It was established late in the 1840s, rendered almost redundant by the early 1850s, briefly garrisoned by the returning US Army after the Civil War, and the site of it finally sold to a local leading citizen who transformed it into his family’s homestead. Most of the buildings present, set out among a scattering of oak trees in a foot-ball field rectangle running from the verge of Rte 290 down to the banks of Baron’s Creek are reconstructions. There are some few foundations left here and there of a sulter’s store and the laundry, set conveniently close to water, down on the creek-bank. There are a few stones left of a huge oven to bake bread for the soldiers, nothing at all left of where the warehouse and post hospital was, nor of the stable for the dragoon’s horses, and the blacksmith’s forge. The approximate position of the commander’s house is merely outlined in stones. The only original building, from the time when it was an active US Army establishment is a thick-walled limestone building with very tiny slit-windows in one end which served as the guardhouse and military jail – when the property was sold to the Brautigam family, it was added onto and became their home, until the site was sold to the city, and restoration of the long-decayed original buildings began. It wouldn’t have been one of those dramatic forts, in it’s time – no bloody sieges, no great expeditions launched from the little parade-ground, between the whitewashed log, or stone buildings. The front-porches of the officer’s quarters, and the breezeways between the three-pen log enlisted barracks would have looked out on little but the same military garrison routine, day after day. Moving supplies from wagons coming up the road from San Antonio and the coast into the warehouse, shoeing horses and doing laundry, mounting guard and standing retreat at the end of the day – that would have been it, for the soldiers and their officers sent her for a bare handful of years. No doubt many of them spent their time in a quiet backwater of the Texas frontier, hoping that something exciting would happen, something to break up the boredom and routine of peacetime service, something that would bring them glory and renown. For a good few of them, that supposed wish did come true, in the following decade, when officers who had served at Fort Martin Scott – like James Longstreet – did indeed find glory and renown. Very possibly, they looked back then on their tour of service at a tiny fort on the banks of Baron’s Creek with considerable nostalgia.